'Pill testing': How would it work, what would it tell us and what are its limitations? Fatalities linked to dance events first hit the headlines in 1995 with the ecstasy-related death of a 15-year-old Sydney schoolgirl who had attended an underground 'rave' party. Her death led to community outrage about drug use at nightlife events and calls for the government to 'get tough' and clampdown on this type of activity. Almost overnight we saw heavier policing and greater regulation of the so-called 'rave scene' take place. Over time, the smaller underground events disappeared, only to be replaced by the increasingly popular festival scene. Rather than 100s of partygoers, we started to see up to 30,000 young people attending a dance event. Although rare, deaths continued to occur and with each one there was greater pressure on police to respond, eventually leading to the introduction of drug detection dogs. Still there were more deaths. The response? More police and more dogs. These events are now so heavily policed, that walking into a music festival can feel like moving through a police station (at the last event where a death occurred there were over 130 police and 140 security staff present) … and yet still young people continue to die. It's clear that simply getting tough is not stopping deaths from occurring. You could put as many police as you want at the front gate (and throughout the venue) but if a young person wants to pop a pill, snort a powder or smoke whatever, they're bound to find a way … So is there another option? Is pill testing the answer? There are a range of pill testing programs that operate around the world, some supported by governments and others that are tolerated and even endorsed by local agencies, including the police. The type of program receiving the most attention here, however, is 'on-site' testing (with a pilot program being run in the ACT earlier this year). This involves festivalgoers being able to directly submit a drug they are planning to use for analysis at the venue. Chemists then use state-of-the-art technology to identify what substances are present. Once the results are available, the potential user is provided detailed results as part of a confidential consultation (usually taking between 15-20 minutes) delivered by health professionals. The drug is not returned to them and all consultations include a general warning about all drug use carrying risks and that drug use is not encouraged. At no time would a user ever be told that the drug they submitted for testing was safe to use. Pill testing is all about providing information to potential users of drugs and, as an educator, I totally support the strategy. What I don't support is how it is being sold by some as some kind of 'silver bullet' that will magically stop all drug-related deaths at nightlife events. To see people respond to a death of a young person by saying "If there had been pill testing available this wouldn't have happened", particularly when we don't even know the actual cause of the death, is simply non-sensical … It's important to acknowledge that the strategy has limitations. Testing results only relate to the sample that was tested and cannot guarantee the contents or quality of a wider batch of the drug. Two pills might look the same but may be of different strength or even contain different drugs and adulterants. But most importantly, no drug is completely safe and simply knowing what's in a drug doesn't mean the user won't experience problems. We also have to remember that some people are just going to do silly things, regardless of the information they are provided. Last year a 22-year-old young man died at a music festival in Victoria whilst being treated by paramedics. The Coroner found the cause of death to be "multidrug toxicity", with the post-mortem finding 16 different substances in his bloodstream. The drugs identified included alcohol, MDMA, MDA, temazepam, oxazepam, atropine (a medication used to treat nerve and pesticide poisonings), ketamine, cocaine, diazepam and Xanax. The Coroner's report stated that "some of his friends told him to 'pull up' as they believed he was using too much". Would pill testing have possibly prevented this death? Most probably not. "Just want to say thanks for visiting our school and for giving us the info about MDMA. I had been considering trying it when I go to Schoolies but after hearing what you said I've decided to give it a miss. It sounds like it's not worth it at the moment"
That's the message, word for word! Now ther is no way of knowing whether he did or didn't take a pill when he went partying at Schoolies, but at the very least the testing data made him think (even for a short time) about the potential risks associated with using the drug. That's pretty damn impressive! If pill testing was to be introduced at music festivals I believe it must just be one part of an overarching strategy. Regulations ensuring a safer physical environment for patrons that cover issues such as water provision, organising security and first aid are vital. Policing is also important but the available evidence shows that simply 'getting tough' does not lead to less drug use and reduced harm, in fact, it is likely to do just the opposite. Illicit drugs are just that - they're illegal and, as such, police have a job to do but armies of blue uniforms greeting festivalgoers is not helpful. The final part of the strategy needs to be education and the provision of accurate, up-to-date and credible information. Utilising the results of pill testing to illustrate the variability of the contents and at the same time highlighting that testing alone cannot remove all the danger associated with ecstasy and other drugs could, at the very least, make potential users think twice before taking something. Of course, the only way to ensure that a person comes to no harm from ecstasy/MDMA use is for them not to take it. For most young people, that will be the choice they make. Sadly there will be others who will use the drug and not survive the experience. In the last four years, largely due to increasing purity, there have been 226 ecstasy-related deaths in the UK. Around half of those were teenagers and people in their twenties. This year, at least five of those who died were young women aged 15 or 16. What is most concerning is that some of these deaths did not involve festivals and nightclubs – one girl took ecstasy to walk on a mountain, another used the drug to celebrate finishing exams and the other took ecstasy in a park with three of her friends. All of these girls were 15-years-old! Testing pills at a music festival would not have prevented any of those deaths. 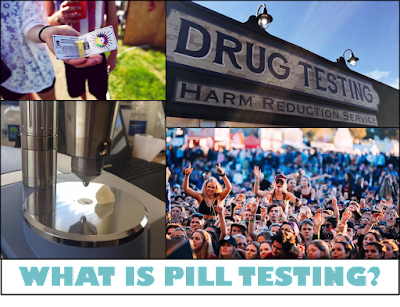 However, the information collected during pill testing, if used appropriately and in the right context, could be useful in ecstasy prevention education. Ecstasy/MDMA use is becoming increasingly normalised amongst particular populations of young people - believing that it is 'just what you do'. When you have groups of 15-year-old girls taking it in a park on a Saturday night just to have fun, that's a worry! What we're doing now is not working - there has to be another way. As I've already said, pill testing is no 'silver bullet' - it won't stop all drug-related deaths from occurring at music festivals and other nightlife events (or elsewhere for that matter). If we shift our thinking just a little, however, and start seeing it not only as a 'harm reduction' strategy but also as a potential 'prevention education' tool it may result in even broader benefits than have previously put forward.